I have the HARDEST TIME keeping my car organized. With kids there are always toys and loose french fries scattered all over the back seats. But I can’t always put the blame on my children—I’m guilty of leaving the car a mess too! 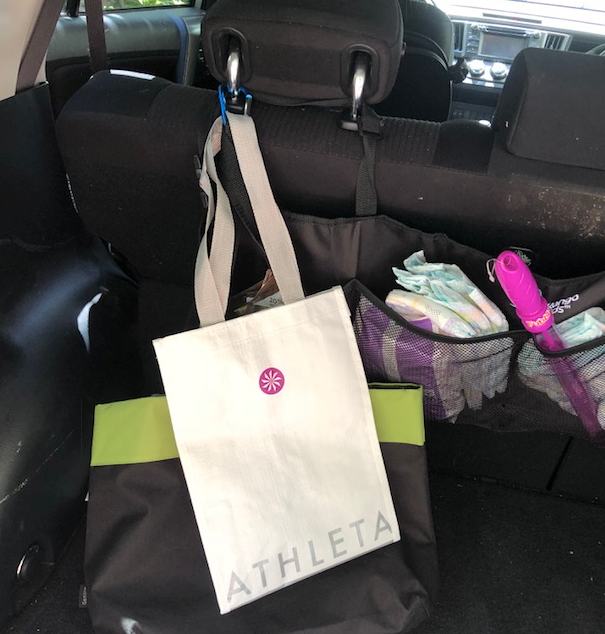 If your car is always messy and unorganized like mine, try out these cheap and easy car organizing ideas to help you stay on top of the mess! My cupholders are ALWAYS filled with loose change, gum wrappers, bobby pins, and loads of other junk. Not to mention crumbs…there are crumbs EVERYWHERE in my car. 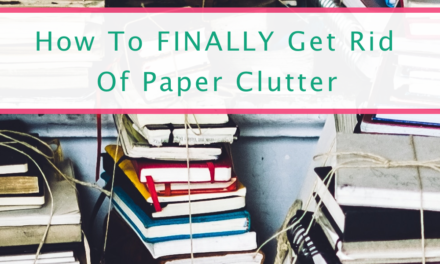 With kids, crumbs are kind of inevitable, but there is something you can do to control the mess. 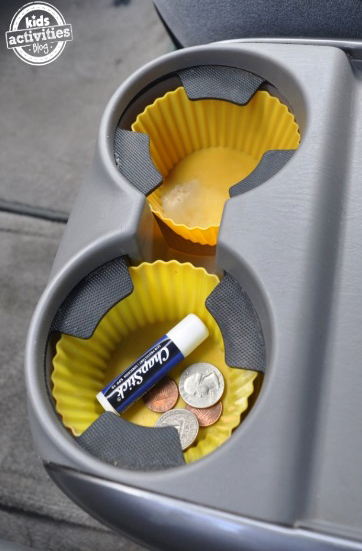 Use silicone muffin cup containers like these to keep those cupholders tidy and free from any spilled messes. 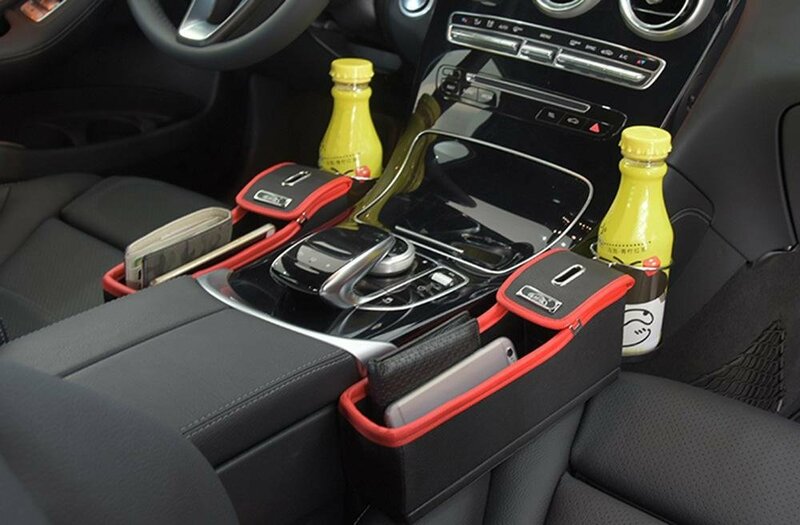 For another cheap and easy solution, use dollar store popsicle molds for stashing all the loose change, knick-knacks, sunglasses, and other items that tend to clutter up cupholders and the area between the seats. 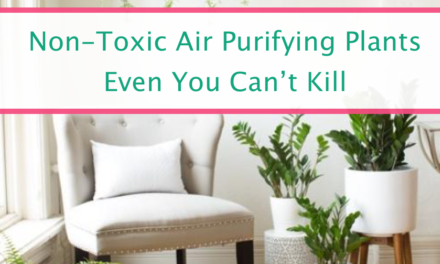 Tip via HGTV! And for a quick fix to your loose change problem, try out one of these car pockets with coin collectors for between the seats! Never loose leftover change again—or at least never just toss it in the cupholder! 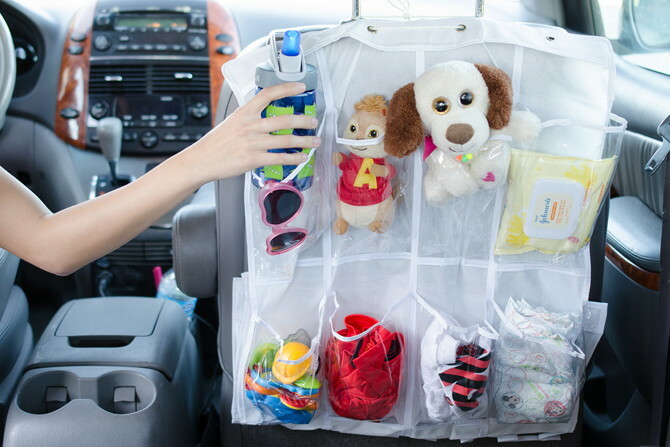 These pockets are a definite life-saver and will keep your car organized in no time. Not to mention these pockets provide a great place to stash your phone—never lose in between the car seats again! There is a never-ending collection of loose bags going on in my car right now. Problem is, I WANT to keep them in the car so there’s easy access, but what’s the best way to keep all these bags organized? Just get some cheap carabiners like these and clip them on to the back of headrests for easy storage and access. You could also even hang umbrellas and other items that tend to clutter up your car here too! One of the easiest ways to keep your car clean and organized is to keep a trashcan in the car at all times. This way there’s some place to put the trash inside of holding on to it (and then forgetting about it) until you get home. BUT a trashcan that’s NOT spill-proof? Not good. 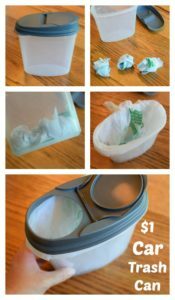 A Bird And A Bean had a great idea: DIY a spill-proof trashcan for the car using a plastic cereal box container! Now you’ll find have a way to contain all the mess! Okay, so I’d like to say that I never feed—God forbid—fast food to my children. As soon as I became a parent I realized that drive-thrus are the best invention ever, and the convenience and ease is a small price to pay if I have to give my kids a happy meal once and awhile. 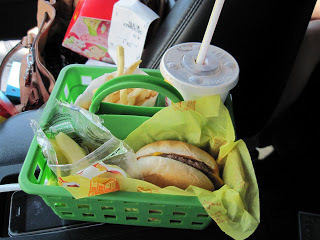 These dollar store DIY fast food organizers are great solutions for eating meals on the go, and maybe (just maybe) they can actually keep the spills and loose fries to a minimum! Of course, you can always feel these containers with healthy snacks too—it’s perfect for holding bananas, trail mix containers, even sandwiches! 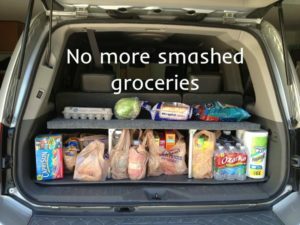 Most times we can’t avoid filling our cars with stuff. We need gym bags and tennis racks and soccer cleats for all the kids activities. And don’t forget the first aid kit, extra trash bags, and towels to deal with any of the messes that come with hauling our families around from place to place. But when it actually comes time to running errands or getting groceries, how can we find the space we need when space is limited? Enter the DIY trunk shelf organizer—it’s super easy to put together and is a great solution to keep your car trunk organized. Now everything has a place! Now for all those little items that you know you HAVE to keep in the car. The baby wipes, extra diapers, hand sanitizer, sunscreen, napkins, and of course all those toys. Organizing these essentials doesn’t have to be difficult or expensive—just use a hanging shoe rack! 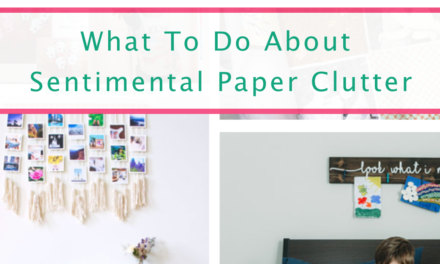 Chances are you probably already have one of these lying around too! When we’re traveling on a longer car trip we definitely bring all the electronics we can to keep us (well the kids) entertained on the road. But with all these electronics come all the cords, and it’s hard to keep them all organized. I love these cord clip organizers—they are perfect for solving cord clutter mess and they attach right to the dashboard or the side of the car for easy access! I’m always losing pens under the seats in my car. And my sunglasses? Forget it. I’m sure these are somewhere in the unreachable places between my seat and the center console. 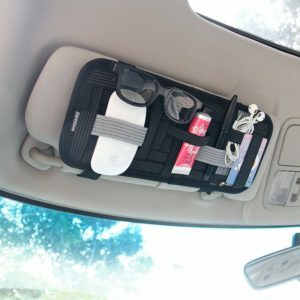 I just got these car visor organizers and they are AMAZING! I love them because you can put anything up there you want and it stays—makeup brushes, earbuds, CDs, sunglasses…you name it! 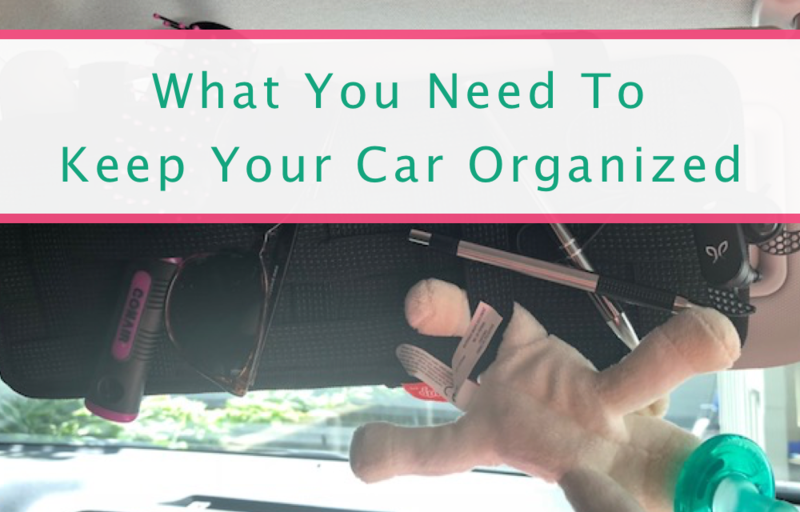 These cheap and easy organizing interventions will keep your car organized in no time! 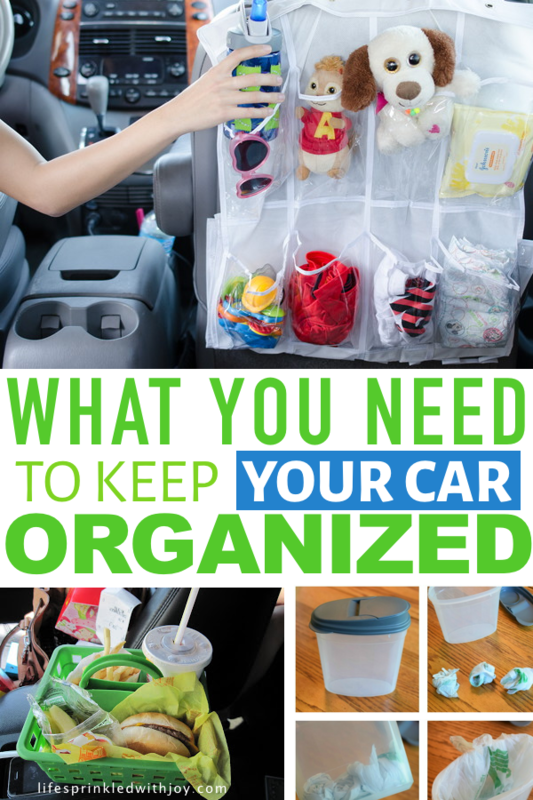 If you’ve got some more ideas on how to keep your car organized, post a comment!